How to make a never-ending card. The things you need to get the basic never-ending card is a square card or twice a square piece of cardstock, a cutting knife, a ruler, some double-sided sticky tape and some patience. 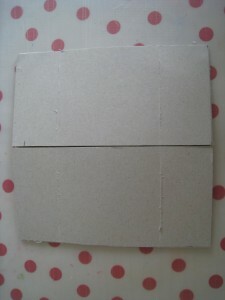 Now for starters, you need to cut your card in half so you have 2 squares (or start with 2 pieces of square cardstock). 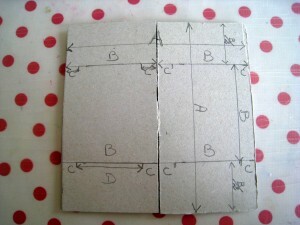 The length of the sides of your square = A (in my example 12 cm). 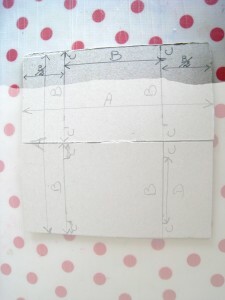 Cut each square in half lengthwise, so you have 4 rectangles, measuring A by B (my example 12 cm by 6 cm). 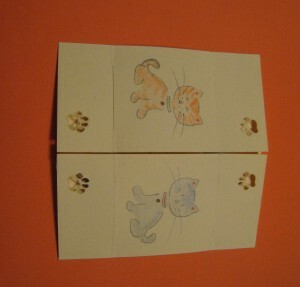 Each rectangle now needs 2 cuts (D) which will make for easy folding. 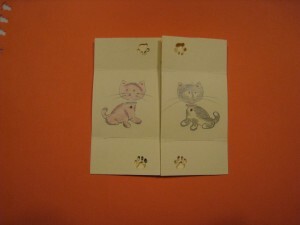 Turn each piece sideways and measure half of the width off left and right , top and bottom. 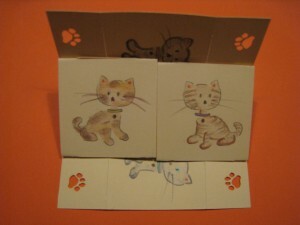 Now draw lines so your single piece of card is divided in three: 2 small rectangles each side and a square in the middle. Those lines you need to measure off again. where C for me was 1cm and D 4cm, those who measure in inches can make C about half an inch, just make sure the card won’t rip, as now you need to make an incision over the length of D. Just scoring won’t do, as we have to fold back and forth. C will act as a hinge. Do this for all 4 pieces of card. 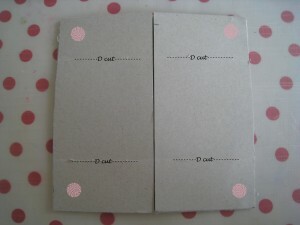 Take two of the prepared card pieces and lay them next to each other like shown , put a square of double sided sticky tape where the pink dots are. 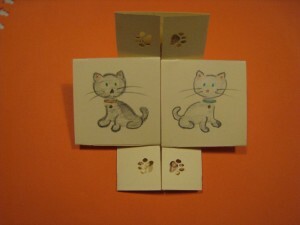 Take the other two bits of card and place them like shown and stick them on the other two cards. Rein's Cookumentaries and other Stuff is powered by	WordPress 3.3.1 and delivered to you in 0.156 seconds using 40 queries.